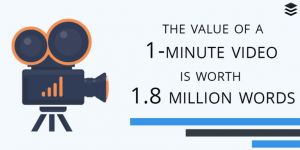 With 80% of the world’s Internet traffic predicted to be made up of video content by 2019, there has never been more need to embrace video marketing as one of the most effective types of communication across multiple platforms. Video creates the opportunity to engage and ignite emotion within a consumer, which in turn gives a brand the chance of developing strong alliances with a viewer through eye-catching, plus easy to consume messaging. Video marketing also has a greater organic online reach making every viewer a potential brand ambassador, as they are more likely to share video than any other form of content online. Consumers now regularly view video related content as they refer to @YouTube for how-to advice and troubleshooting on products, @Facebook video for breaking news, and @Instagram for behind-the-scenes clips of their favourite brands. Engage. Research shows that you have approximately 10 seconds to grab a viewer’s attention before they click away. Spark their curiosity with teasers and questions that give them a reason to keep watching. Keep it short and sweet as engagement drops off significantly after 2 minutes. Educate or Inspire. Video invites the viewer into your world and gives you the opportunity to show them your product in action or provided a guided tour of your premises. Provide added value by teaching your customers more about how to use your product or service and inform them with helpful tips and problem solving techniques. Endorse. Include videoed customer testimonials. Video success stories will build trust and create long term relationships with customers who will feel invested in your brand. Mark Zuckerberg said last year “We see a world that is video-first with video at the heart of all our apps and services.” So are you ready for this? Contact the team at Media Managers to discuss how we can develop and incorporate video into your marketing strategy. Take a look at how we used video as part of a successful integrated media campaign for the luxury bed company Duxiana.